Big Wheel Building: Lost and Found: Random gear geekin'. Lost and Found: Random gear geekin'. 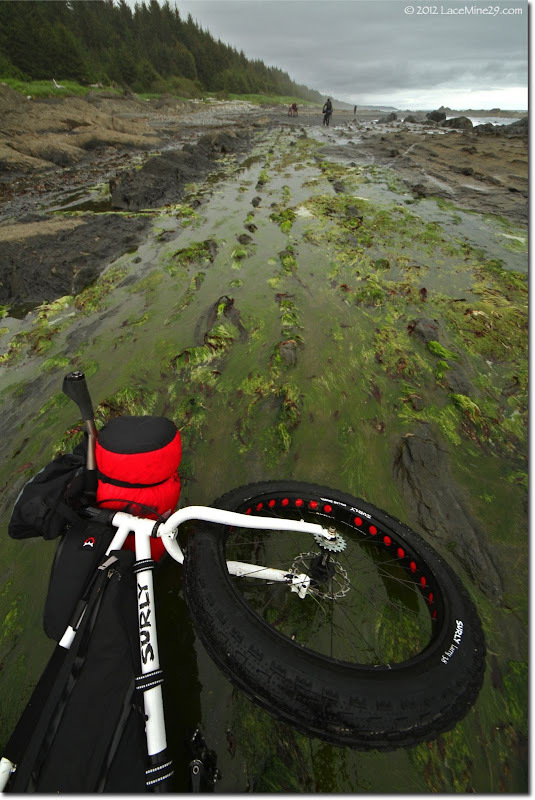 Anyone that's been watching the explosion of fatbikes and packrafts the last few years and been inspired enough to really think about how to carry multiple days worth of food and camping gear (both on land and water) has surely realized that creativity is needed. All of your various 'stuff' doesn't just fall into place--you need to think critically about what to bring and what to leave, and even once you've whittled your pile down you still need to think harder about gear abstraction. 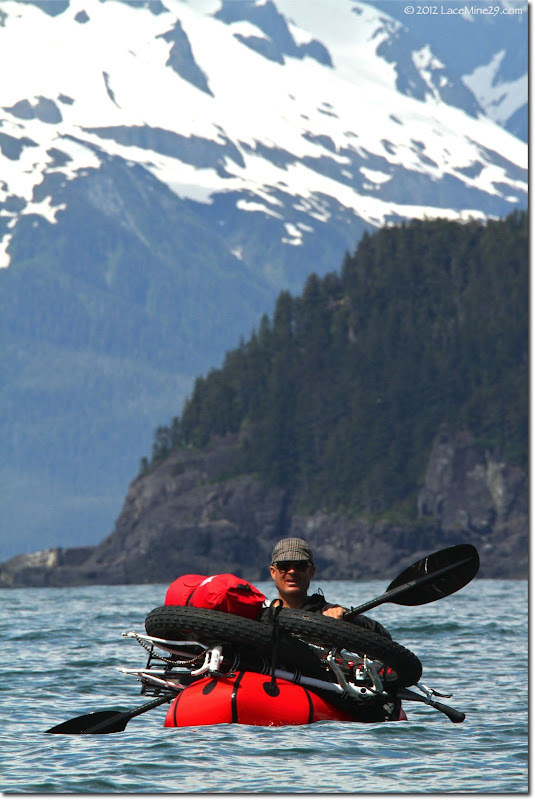 Making one item do the job of many is a skill as valuable as pedaling and paddling. Prior to this trip most of my experience had been on trips where everyone was traveling together yet somehow self-sufficient. On this trip we had several items that were 'community gear' like stoves and tents and tools. Silly to do it otherwise unless circumstances demand it. Once you've whittled your pile down to an acceptable level, gotten it all packed onto the bike, and rolled away from home, that's it right--it's all figured and you just twiddle a friendly gear til it's time to camp, then repeat day after day? No way. I hadn't anticipated this when I left for the Lost Coast trip, but each and every time we deployed boats or packed them back up, something would change with the way we repacked. The others seemed better attuned to the changes in the landscape, and would shuffle gear around to get a better weight distribution--more on the bike for easier stretches of rideable beach, more on the back for bashing through the boulders and rainforest. 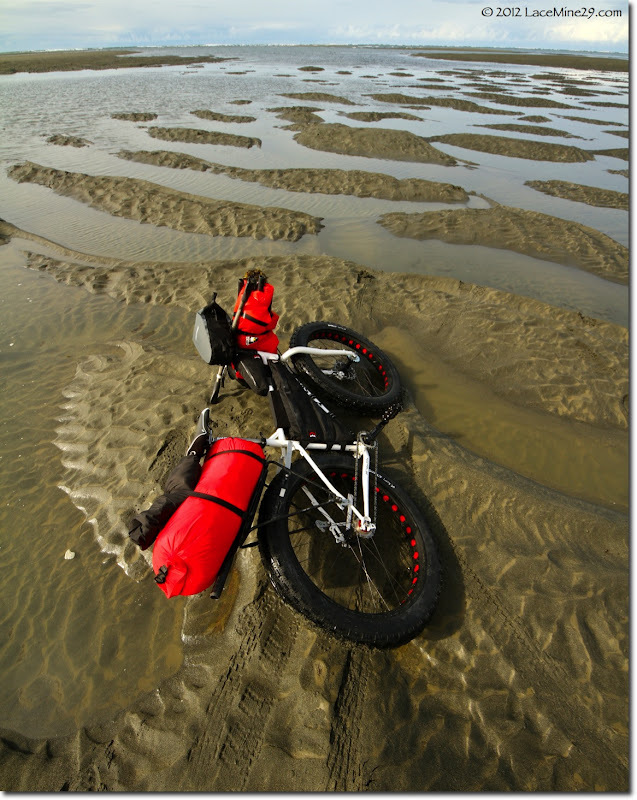 But even then they were making minute changes on the fly as we packed and unpacked--boats in different places on the bike, or in the pack, sleeping bags under bars some times, in packs others, on racks or in seatbags yet others. Not surprisingly, Eric touches on lots of this stuff in his geek post, and (duh) does a better job of explaining most of the why's and how's. Read it more than once. The above setup was great when riding--balanced and compact. But when making the transition to paddle it had issues, and on the boat yet more issues. And it pretty much sucked to 'shwack. My boat-to-bike changes were more reactive than proactive--I was often behind and just throwing things haphazardly back together so as not to slow the group down even further. But after a few days of multiple boat deployments a pattern became clear. Having a rear rack was, overall, a bad thing for me. It allowed me to put a too-large stuffsack atop it, meaning I carried more weight in extraneous stuff than I needed to. The rack also got in the way when paddling, no matter how I arranged the bike on the boat. Having that stuffsack on there also meant that each time we paddled I had to unbuckle the stuffsack and find a better place for it--usually lashed and buckled atop the rest of my bike/gear mound on the front of the boat. Then when packing up it added another step in unlashing it and refastening it back to the rack. Totally unnecessary steps. Later in the trip I put the stuffsack under the bars and the boat on the rear rack--which saved a step in (un)packing. But it was clear the rack needed to go. Before this trip, I'd never been a fan of the mondo seat bags that have gained popularity the past few years. They prohibit you from getting behind the saddle on steep descents, and my 'normal' trips have enough of those that I'd simply made up my mind--I wasn't going down that road. 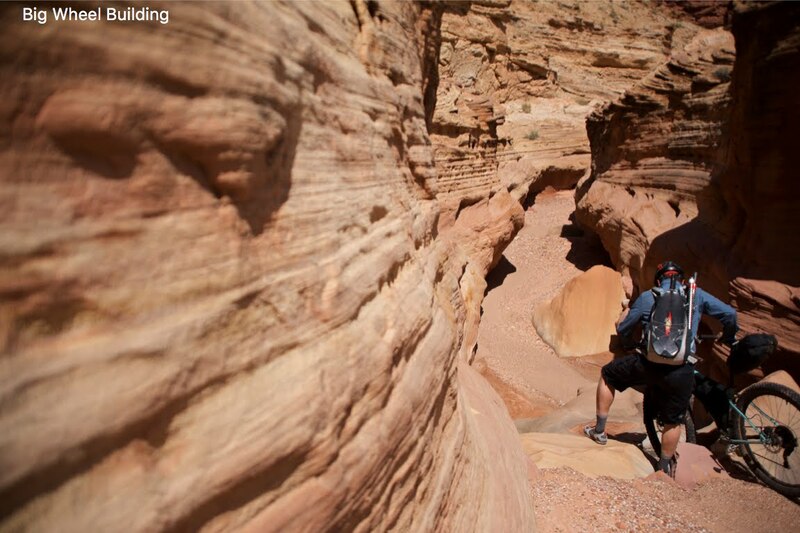 But beaches don't have much steepness to them, so that argument fell flat. My other dislike of mondo seatbags was a perception that all that leverage on gossamer thin seat rails couldn't be a good thing. This was a seat of the pants assessment and as far as I know it hasn't proven true--I know of no one that's killed a seat yet. Still, even after grudgingly accepting the big bags as the clean bikerafting solution, I vowed only to keep light bulk in mine--think sleeping bag and puffy jacket. Not just for my continued fear of rail failure, but because the bike naturally handles better with weight down low. This is what I did on last fall's Lava Coast trip, and with small refinements it's what I'll likely do going forward. More on that trip, and that gear geekery, soon. Boat size is also worth mentioning. Doom and Dylan's boats were very close in size (Alpacka Yaks) despite being 2 generations apart, but the rest of our boats varied significantly--in inches (tube diameter and hull length) as well as weight. Roman had the smallest, lightest boat by a longshot. When riding or 'shwacking his lighter load was clearly an advantage. He could ride a tighter, more precise line than any of us--partially because he's wired to keep things fun that way, but largely because he didn't have as much mass on the bike to move around beneath him. All well and good until it came time to float, at which point Roman would grovel (usually at Doom's feet) until one of us agreed to take his front wheel. Roman's tiny little 10" tubed boat simply wasn't as stable in the water with our high-center-of-gravity loads. When the wind and waves came up it was clear that Roman was nervous and felt tippy, even with his massive level of skill and decades of packraft experience. Boat packing--look no further than Eric and Dylan's clean, compact setups as models to emulate. Both wheels off and stacked, both pedals off, even bars off, then strap pack on as counterweight to wheels. Low and compact, easy to manhandle the boat on shore, more maneuverable in swells or surf, with less chance of something catching water and pulling that side down. Packed high and wide like this my setup was tippy in waves, unstable in wind, and much more likely to 'catch an edge' and flip. The wonder is that I only swam once. My takeaway from this trip is that 12" tubed boats were muchmobetta than 10", and length of the boat was irrelevant as long as you could pack and paddle without obstruction. I also came away convinced that the newer Alpacka hull designs aren't mandatory by any stretch, but the upturned bows and pointed sterns definitely improve flatwater tracking--it's easier to go straighter in the newer boats, even/especially when heavily loaded. The 'main line' of Alpacka rafts (Alpaca, Yak, and Llama) are their most popular boats for a reason--it's hard to see a compelling reason to choose anything else. Pick the size that fits you and your needs best, don't skip the skirt, and you'll be well sorted. Clothing and kit for a trip like this are as varied as the background of each participant. The underlying tenet, not surprisingly, was pragmatism. We had lots of wool (hoodies, boxers, tights, socks, hats), all synthetic quilts and bags and puffies, some random fleece, and two mid-style tents. Doom's wool tights and Roman's wool shirt looked like they needed retirement a decade ago--clearly they'd proven themselves to the point that countless holes and runs and tears were of little consequence when faced with taking anything else. The bikes all were geared pretty similar--all running roughly a 1:1 or slightly easier ratio--except for Roman. He had a shiftable dingle (scroll down) setup that seemed great on paper but still wasn't enough to win him the final sprint. No doubt he's rethinkering that and dreaming up some convoluted way to get a rematch. I relubed my chain whenever I could--usually about once a day. Contrary to expectations, the drivetrain wasn't dead after this trip--I just lubed it up and kept riding it, including another ~270 or so miles on the Lava Coast. Still going strong on this bike--but it now belongs to my Dad. Between Lost and Lava I peeled the seals off the hub bearings and massaged fresh grease in. Pushed fresh grease into the King BB and called it good. HS bearings were fine. Peeled tires off of rims to find the baby powder inside still fresh and dry and in need of nothing--so I just aired 'em back up. Packs. Bigger was better here--at least 50L was needed and even 60 to 65L was realistic. How to achieve that volume was debatable. Doom, Eric, and Dylan all had fairly similar UL backpacking type packs, and their systems all seemed to work great for them. Roman's system was different--essentially a basic harness holding a massive drybag, with the contents acting as the 'frame'. Set for riding--bulk of load on bike. Set for shwacking--everything in pack. Set for a short paddle with (I think) a need to get in and out quick--big current along the far shore? Hence pack on back and bike strapped tight and low. Load moved to rear rack and back for techy riding--light front end is mobetta. 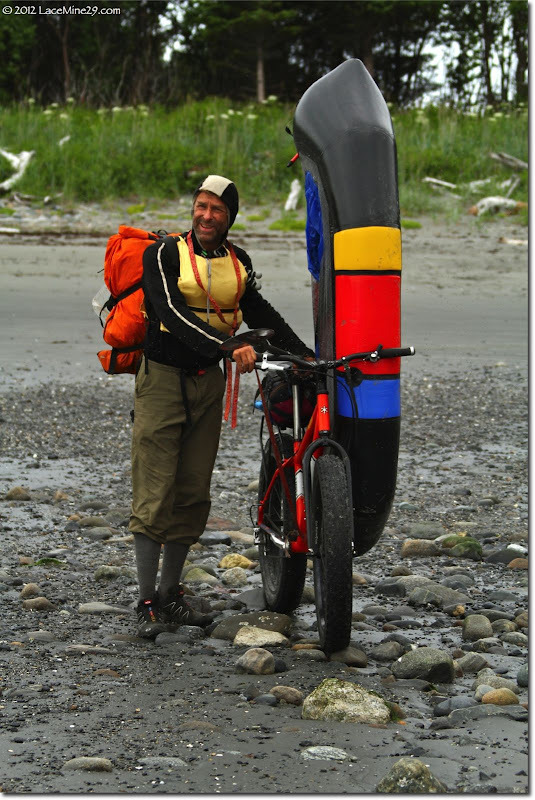 For several reasons Roman's setup made the most sense to me--it seemed the most versatile (not just for fatbikerafting, but for backpacking and skiraftineering) and adaptable from my limited perspective. I've thrown my eggs into that basket and have been fiddling with and heavily modifying a similar clamshell harness pack for future trips. The best way to sum up here is to say that any pack system (as with any bike, raft, camera, _______, etc...) can work, it's up to you to spend the time finding the issues and solving them on fun backyard trips before going bigger. That I'm aware of, the only turn-key similar harness setups available these days are made by ULA and NRS. Neither of those scratched my itch out of the box, so instead of dropping $$$ and then cutting them apart, I cobbled mine together from the dregs of two older packs--it is an ugly but very functional work in progress. Food. The thought of the culinary delights on this trip just makes me laugh! We all ate freeze dried stuff to some extent. I had it for breakfast and dinner almost every day--usually recipes of my own concoction like ham teriyaki and beans/rice/sausage/veggies. Doom had a *killer* freeze dried pad thai on a few nights. I sat close to him then. Roman had some really bland meals that no one liked--not even him. I traded him on one night because he hadn't been eating enough--looked a little anemic. He came alive with his best jokes of the trip after macking my mega meal. That'll learn him. Roman's nightcap of powdered milk was a great idea that I hadn't seen implemented before. But the real creativity came from Dylan and Eric, with something like 11 solid pounds of butter and cheese between them. And another 5 or 6 pounds of cookie dough. Livin'! 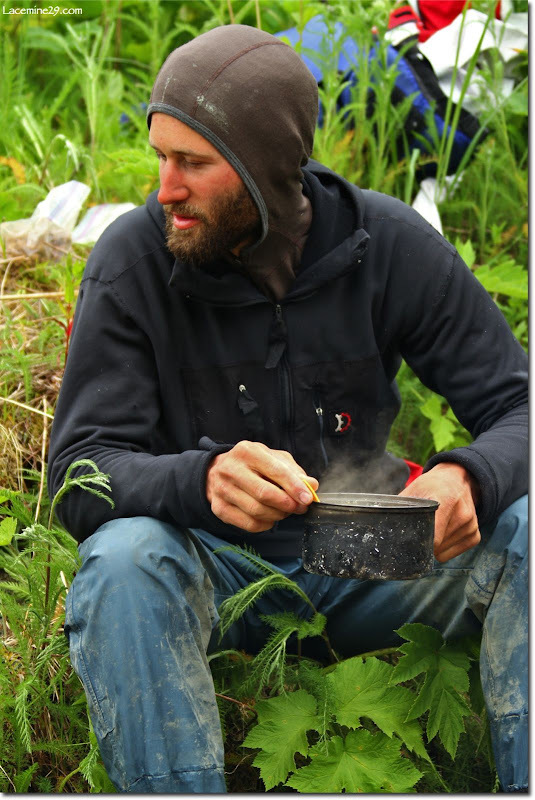 Nightly, Dylan would heat a ~few liters of water in his pot by the fire, then pour in a pack or two of ramen, stir a bit, then fill in the gaps with dehydrated potatoes, stir some more, then ladle in a quarter pound of some blend of dairy, often seasoning with a blend of hot peppers Roman brought along. The resulting concoction would overfill a 2L pot--only by eating it down as it expanded could Dylan keep it all under the lid. Then he'd work on it in fits and starts over the next hour--seemingly consuming a mass equivalent to his own. Paddles. Eric and I took AB Splats, everyone else had Sawyers. Splats are indestructible as far as I can tell--follow Eric around and watch what he does to his some time and you'll see. I've since sold my Splat and replaced it with a Sawyer. The Sawyer is lighter but not by a huge amount--not enough to justify the added cost. But it breaks down smaller--5 pieces instead of 4, and the infinitely adjustable length and feather is oh-so-nice for adapting to conditions--wide glide with 30* of feather at ~230cm on flat, windless days, down to ~205cm and 60* of feather when the wind and waves are up. Added bonus that you can adjust tension on your mid with the length-adjustable Sawyer more easily than stacking rocks or sticks or sand beneath the Splat. PFD's: Eric, Dylan, and Doom all had real-deal USCG approved off-the-shelf units. They used them as intended, sat on them at camp at times, but also had the option to use them as an extra insulating layer had it gotten cold enough. Roman and I both used improvised inflatables. I tested mine by inflating it then walking into a lake and swimming around for a bit to find that it floated me at least as well as something more legit. Not sure how Roman tested his. On the Lava Coast I took a real PFD and used it as part of my sleep pad--and slept like crap most nights. Contentious subject here--do your due diligence and make your own call. There are a few other random tidbits and misc minutiae in my original 'beach bound' post. All I can think of for now. I've disabled commenting here because I'm tired of fighting spambots for control. Any questions on stuff I missed, omitted, or wasn't clear on? Please post those here and I'll do my best.